The construction crew utilized a number of energy efficient features, including special exterior wall material to prevent temperature loss inside the home, spray foam insulation, energy efficient windows, Energy Star-rated appliances, a tankless hot water heater and florescent or LED lights. The house earned a Home Energy Rating System (HERS) Index rating of 46. That’s far better than the national average of 61, according to the Residential Energy Services Network. 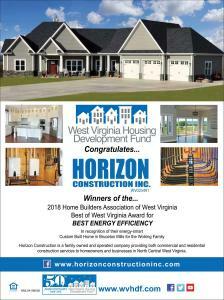 The West Virginia Homebuilders Association and the Fund are teaming up again this year to honor a builder dedicated to energy efficiency. For more information, please contact Patti Shamblin.